We slept until around 9:00 this morning and I got up and cooked breakfast. I got Max to eat his eggs by telling him he needed them for energy at the swimming pool today. 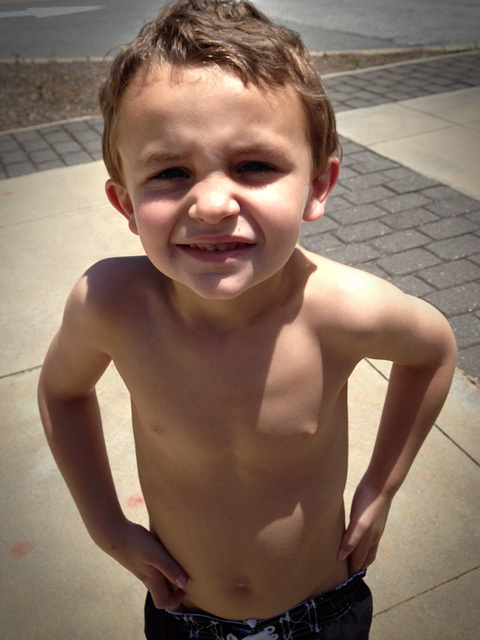 He spent the morning asking me, “How much longer until the pool opens?” We were waiting for the pool at the Collins Hill Aquatic Center to open. Surprisingly, the pool closest to us, the one at Bogan Park, is closed until September for remodeling. Max and I stayed at the pool for about three hours. He went down the little slide about a hundred times. Oh, he had so much fun. He played with a six-year-old boy. They chased each other and had the best time. I know Max will be pestering me about going back as soon as possible. We came home and took a short rest before Max got ready to go fishing at Mrs Wigley’s with Grandpa. He wore his shirt that says, “Daddy’s Best Friend,” but he said it should say, “Mommy’s Best Friend,” too. He and Grandpa were going to meet a twelve-year-old boy who fishes at the Wigleys’ pond almost daily, but they couldn’t get Max’s reel working in time. They took the reel to neighbor Stephen, who fixed it. Grandpa says they’ll try again tomorrow. Max is spending the night with Mimi and Grandpa tonight. Jaddie and I are about to tune into All in the Family, but we miss our little buddy. This entry was posted on Tuesday, May 28th, 2013 at 10:14 pm EDT	and is filed under Max. You can follow any comments to this entry through the RSS 2.0 feed. Both comments and pings are currently closed.